When you’re in the entry level position then you are the starting block of the organization. Once you are in the entry level position, know that you have more doors to be opened and climb the ladder. One should be hardworking and enthusiastic in order to move up in the entry level position. These entry level jobs can put you on a rewarding career down the road. 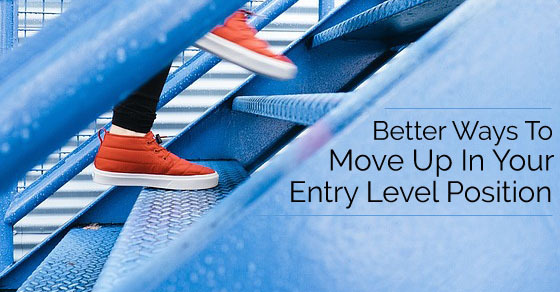 Let’s glimpse through the below tips about better ways to move up in your entry level position. How To Move up From An Entry Level Job? Any candidate can owe their success only to their mentor who assisted them in all ways in their career. A good professional mentor plays a main role in an employee’s success. You can gain a valuable contact, and sound person to whom you can share all your good and bad in the industry. Look out for any individual in the company who you admire. Invite that person for a meeting and share professional experiences. The relationship with your mentor can be done with a tweet, mail or a LinkedIn connection. Being in the entry level position the candidate must be aware of all the requirements for the role in order to get to higher position. These are little information that you do not know and hence should find it. Seek articles, read more books, get in touch with experts in the industry and get to know about the requirements for your job. Apart from concentrating on your career you also need to create a plan about where you want to get to. There are a number of steps to take forward in order to reach your next level in your career. Make a plan with the new skills required, certifications you need, degrees and more. Make use of a spreadsheet, calendar or a table tool for reference. Have a communication with the boss, and let him know that you’re intended to get to next higher position. It doesn’t need to be a formal talk; it can be done when you’re in the lift, at coffee or at the gate. When there is any position opening up in the company then it can be considered as the ideal time discussed about career advancement. In order to advance in career, improvement is mandatory. There is not much expectation as an entry level employee, but you should let your manager know that you’re interested in learning and getting to higher levels. Building network is one important aspect that helps you get ahead in your position. In that manner to move up in your entry level position, you need to build your network with professionals. Advancement in your career can be achieved only when you know people in your industry. It is also important to participate in all events of the company such as parties, cocktail events, events, networking events and conferences in the industry. By this way you can gain important insights within your field and have lasting connections. When you make friends with people in the other department, you can get to know a number of things that happen in the industry. When there are positions going to be open in higher levels, it would be good to get to know about the same by means of friends in the other department. When you just sit down waiting for work, then you aren’t doing any favors for the organization. In order to overcome the same researching and observing is something that helps the company overcome failure and assists the company with success. In order to promote the company online, new brainstorming ideas can be developed. The employee can also provide with new ideas that can boost up slow process in the company. Hence sitting idle without any initiation cannot help you move to higher level. In order to cover the cost of employment, you need to make enough money for the organization. If you aren’t going to make enough money then you might not stay for a long time in the organization. This is true for ones who are in the entry level in the organization. When you think that you do not want to be expense line for the organization, then the employee can bring in more ways to enhance the profit of the company. When you’re in the entry level position of work, you need to think of the next higher level of work and what qualifications are mandatory for the same. Research about the position and requirements for the next level and obtain education accordingly. Also make sure to enhance your skill set as per the next level of job role. When you have decided not to wait for assignments and move up, then you must be ready to take up more of responsibilities and assignments. Also inquire your boss about the aspects that need to be done for promotion. When you take initiatives and have genuine interest then you are marked as a memorable and impressive candidate for everything you work for. In the entry level position of work, you would be aware about what is to be done. Once you decided to move up in your entry level position, then you need to understand your work environment. Take up work and show your skills and prove that you’re eligible for the next position. Try to take up new roles and volunteer on committees. You will be noticed by your superiors, when you advance in your job and show your talents. Bosses are considered as decision makers in an organization and hence making them feel good is essential. They decide whether you need to move up in your entry level position. There is no need for tons of effort that makes your boos feel good. Just make an excellent work, do your job and ask questions. All these aspects would reflect well and help you in moving up from your entry level position. Since you reside in the entry level position, you would be tasked with menial work. It is vital to stay humble and concentrate on the assigned task in a positive aspect. This is one way by which efficiency is created in your work and you reach success. Make sure you have a professional online presence which can help you move in entry level position. Your online presence is important and hence make sure that you have professional stuffs rather than partying and fun. You can also seek the help of third party services to optimize your online presence. In order to get to higher position in entry level, make sure to work harder than smarter. Instead of investing long hours of work, working smart and impressing the decider is important. Work on projects that no one else works and apply your skills and make those unpopular ones into popular ones. Smart work is a best tool that leads to better ways to higher level. When you wanted to move up in entry level positions, make sure to inform others that you’re interested to move up. Do not have assumptions that your boss will know about your interest, instead take initiatives for the same. These are a few tips that help entry level employees to move to higher positions in an organization. The employee needs to research about the position that he desires to move for. The employee needs to update themselves with the required skillset, qualification and other requirements for the position. The employee needs to accomplish all his tasks from his end, and the rest will be done by the organization. Networking within the organization with the other employees is important in order to know information about the happening within the higher department. Vacancies in higher position, news about new projects, assignment of work and lot more are known by networking with professionals. Apart from gathering news you can also get to know the skill set required and nature of work in the higher position. Employees are thus required to research the net regarding the position and also update their knowledge for the job role. Employees can also browse through the company website and get to know the requirements for the next job position. Taking initiatives and working smart are important aspects for entry level employees to reach higher levels. They also need to know that they require to work from their end in order to achieve their goal in the organization.